Keto? Ketosis? Ketogenic? What? These are all words that you might see floating around the health and wellness world right now. You might be wondering what it is? Well, A ketogenic lifestyle is when your diet is based on eating low carbs, high fat and moderate protein. The result is that it puts your body into a state of ketosis which is when your body sources energy from fat stores instead of using carbohydrates. There are plenty of people that are experts in this area, I am not one. My husband and I have subscribed to this lifestyle just recently and are enjoying the benefits of a low carb life. Why? Well, 18 years ago, right before we got married, my husband used the Atkins diet to lose a few pounds. He found it easy, an was successful! After years of my wonderful cooking, pregnancies, and life, we have found the need to switch things up. I have found some amazing recipes, tools, tricks and supplements that are helping us stay the course. 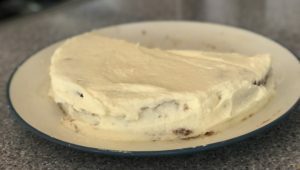 I thought I would add a few posts here and there of items that we love, and recipes that have been successful. 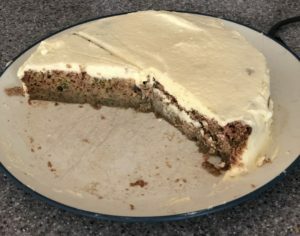 This week I made a delicious Zucchini Cake. My husband has a HUGE sweet tooth, so helping him curb that but also still enjoy a treat once in a while has become a mission of mine.